The test linked above can relatively determine your base type of personality. Yes, there are a limited number of aspects used to determine how someone's personality is. This thread's purpose is to allow users to take this test (preferably a couple times), learn a bit about themselves, and hopefully introspect a bit. This statement I'll go ahead and explain beforehand. Since people are typically biased about themselves and answers can change based on mood, it's best to take the test linked above a few times before drawing a conclusion, if any. Want more information? Then click here. Feel free to post you're own results, affirmations or objections to your results, responses to others' results, and your opinions if they aren't stated with underlying cynical insults. NOTE: The MBTI test is not meant to tell you the future, or how you are classified down to the last proton. The test is meant to determine your persona's basic...genre...of sorts. And it only reaches this conclusion after it measures the input YOU give it. I've taken the test a handful of times, and my results hover around INTJ and INTP. 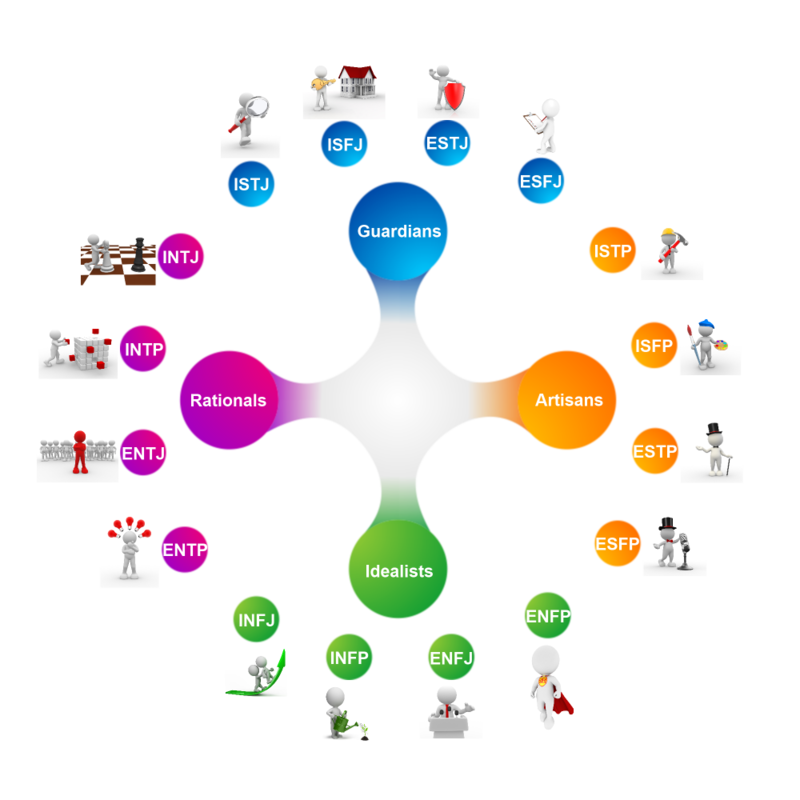 The most rare Personality Types are INFJ, followed by ENTJ and INTJ. 1) Your Type is relatively rare and therefore your natural talents should be in great demand. 2) There are not many of you out there, so it may be hard to find people you can truly relate to. 1) There are a lot of people like you out there in the world. It should be easier to find people who think and behave the way you do. 2) You might find it easier to fit in than an INTJ, or INFJ would. Got INFP. Not even close. I got INTJ, INFP and then INFP again! I've taken this test before and got those two results as my most common Myers-Briggs results but I personally believe that I lean more on the INFP side than I ever will on the INTJ side. INTJ's are far too rational and logical for someone like me; this being said, I can understand why I would be classified as one under certain circumstances? Gregory House from House M.D. @--Jack-- Point. I apologize. Will delete right away. @johan_5179 Sorry for rushing to conclusions and taking out my bad mood on you. They absolutely love new ideas and theories and would never miss an opportunity to discuss them with other people – however, this never-ending thinking process also makes them look somewhat pensive and detached, as INTPs are perfectly able to conduct full-fledged debates in their own heads. The INFJ type is believed to be very rare (less than 1 percent of the population) and it has an unusual set of traits. Even though their presence can be described as very quiet, INFJ personalities usually have many strong opinions, especially when it comes to issues they consider really important in life. If an INFJ is fighting for something, this is because they believe in the idea itself, not because of some selfish reasons. I like to take this tests every 6 months or so to see where I stand and usually it's in the IN--- field, it's always INFP, INTJ, or INTP. I personally think it has more to do with the fact that my results depend more on my mood, I'm thinking maybe I should pick my answers based on the observations from maybe a friend or a relative just to see if it's consistent. That would be really interesting to do! I don't know who would do it for me though? And my results tend to vary on my mood too, apparently. Didn't really read the detailed description, but there's a photo of Putin there, so I guess it's not bad. Well the result description was spot on. 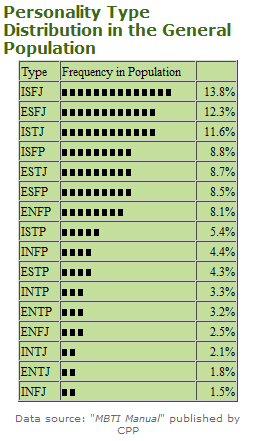 The number of people scoring INTJ on CL appears to be disproportionately high. I'm kinda curious now so if everyone posts their results I might throw some rough stats at it. CL is clearly dominated by IN- types though. Oh, and I got INTP. I got the INTJ result. I got INFP, but after reading the other descriptions, I think I'm close to ISFJ and ISTP as well. Took this test before, I still tested for INFP. I decided to retake the test out of curiosity and I got INFJ...which is weird. INFJ personalities are drawn towards helping those in need – they may rush to the place of a major disaster, participate in rescue efforts, do charity work etc.. I am now fully convinced how I answer these questions is more dependent on my mood. Because I am confused by these results, I know I am not this nice or altruistic. But that may just be your perception of yourself amigo! That's why I like these tests, they can be kind of revealing! Also Mau, you are very much nice! You are very helpful and very charming and very very sweet! Shhhh, you totally know you're as nice as a cupcake! @Maudia Who knows? Maybe it'll get more apparent once you get out of your twenties. If an INFJ is fighting for something, this is because they believe in the idea itself, not because of some selfish reason. I can understand why it's so rare, though. The idea of someone fighting only for what they believe in and not switching around viewpoints to suit their own goals is pretty jarring. Almost creepy even. If this is your actual personality type, I am more than a bit scared of you. I also have taken this test multiple times before (and on other sites) & I usually get ESTJ. Which matches me by a whole lot but not completely in real life. Maybe about 80% of what's said in it is true to me. In video games such as mmorpgs or sandbox multiplayer games, I do take a strong role in in tho.